If you are like me you don’t send Fedex packages too often (not yourself, at any rate). I happened to do that a couple of days ago and was quite tickled to see a simple change that Fedex had made to their envelope. You know, the one made out of stiff cardboard which looks like it can stop a bullet if need be to save the two sheets of paper inside. Well, Fedex is doing its bit to save the planet. What they’ve done is they made the foldover (“lip”?) on the envelope longer and put two strips of adhesive instead of one. The first time you use the lower strip to seal the envelope. The receiving party opens the envelope using the handy “opener” (?) embedded into the fold. 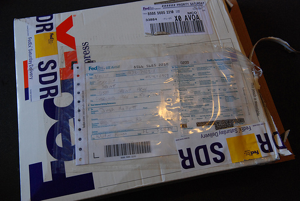 After opening it, there still remains one strip of unused adhesive which can be used to send out another fedex package. I thought it was very ingenious. But the tubelight went off only after I had assiduously used both strips of adhesive to make doubly sure that my super important package was sealed shut! This entry was posted in Uncategorized and tagged Sustainable Living. Bookmark the permalink. The reuse envelope was first introduced to be able to request a reply from a party without having him pay for the fedex service. Guess, it can be preceived as a green planet motive.